Today in lesson seven, I’m going to talk about plugin basics. This is just the basic overview of plugins. So I’ll talk about the various different types of plugins and how you can use them and how they work. Please, as ever, leave questions and comments below, and let’s have a great discussion on how you use plugins, what you use them for, and we’ll have some fun with it. Okay, and please, subscribe, go to producelikeapro.com and sign up for the email list, and you’ll get free drum samples, you’ll get some files to download to edit drums on, you’ll get access to the Vimeo account, and of course, you’ll get notified of all the competitions we’re running. For instance, at this moment, there’s a mix competition where you can win a Phoenix EQ. A DRS EQ. And there’s always tons of other fun stuff, so please sign up at producelikeapro.com, and I appreciate you watching. So let’s have a quick conversation about plugins. Okay, so I’ve got a session open here, just so I can talk about it. I would say the most commonly used plugin, of course, is going to be an EQ plugin. Now, in my session here, I’ve got an REQ 4, and I’ve got this on a kick drum sample, and let me just loop a little bit, and I’ll show you what I’ve done and how you can do it. I mean, you already heard quite a difference. There’s the kick there on its own. Now I’ll put the EQ in. What I’m doing is I’m boosting 60Hz here. So let’s turn off the other EQs. Turn it off. You can hear it’s doing quite a lot. So what the EQ is doing there, and what you’re — you’ll use EQ a lot for is boosting the fundamental. The part of the sound that you’re trying to exaggerate. Now obviously, I’ve exaggerated it a lot there, so it’s quite crazy. What that’s doing is getting rid of some of that kind of low mid thump that I don’t want. It’s just kind of muddiness that’s — another thing about 350 is it’s a lot where some of the low mids on the guitars are that I like, and a lot of the low mids on the bass, so it’s kind of cool to you know, cut it out of the drums where you don’t need it so you can hear it more in other instruments. So you can cut frequencies there. Obviously, we can find things we don’t like. 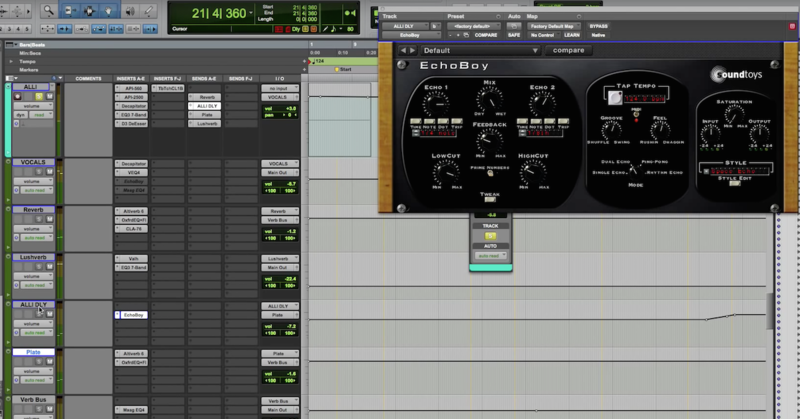 So you can take your EQ and boost it… See how horrible that is? It’s just — it’s good if you want that kind of kick drum sound. It’s kind of fun to do this. And move it around. See what you can do with the EQ. See, here’s 2.5. Right here. I like that. So that’s why I’m boosting it there. That gives it a little bit of the mallet hitting the head. So you can see what you can do by boosting EQ. So let’s go back to 350 on that. A little bit more weight, a little less low mids. I think I might widen this a little bit. Lackadaisical. A little bit more rock. Cool. So you can see what EQ is doing now. What it’s doing is finding a fundamental on a note, boosting it, taking out some of those low mid wooliness we don’t need and adding a bit of click back. So that’s kind of what I like to do with EQ on a kick. Let’s find a different instrument to see what we can do with EQ. Let’s find something totally different. Let’s go — let’s find — let’s use an acoustic guitar, or an electric guitar. What do we have here? Let’s see what this one is. So that’s a heavy guitar, obviously. It’s a good sound. It’s a really good sound. It’s a Big Muff, believe it or not. Big Muff pedal. What I’m doing is I’m boosting a lot of low mids here. You see here. I’m also cutting, and the thing about cutting is I’m letting — I’m actually using a high pass filter here. I don’t need any of the super super lows, because it’s all just mud. It just adds in and creates a lot of mud. That’s too much. But you see what it’s doing? It’s narrowing it down. Let’s add in the bass. It’s completely out of the way of the bass, but thin sounding. That’s nice. They’re sort of blending nicely together now. The high mids here at 4.3. It gives it a bit of grit. A little aggression on it. We’re also boosting some 5kHz at the very top. Too much. Offensive. If this was the only guitar in the track, I might do that just to really give it some grit. It’s not the only guitar, so… four. A little middle-y. Good guitar sound. But what I like about that is it gives me the girth, the lows. So you can really get in there and really exaggerate some of that on the guitar, and then the aggression on the top. So an EQ is pretty useful. I mean, obviously, if you’re overly doing it and you’re using it really drastically, then I’d probably re-record the sound. You know, if that’s the problem. What I’m doing here is a very grunge sounding track, so I wanted — you know, a lot of the grunge bands used Big Muff pedals and distortion pedals, and weren’t using the amps so much, and I like that. But that’s why I used the Big Muff pedal on it. A lot of bit of air here you can add. That’s a lot. I’m using this REQ here, just to roll off 100Hz and below. I could’ve done that on the other one as well. There’s a little bit of nasalness on this particular vocal, and I — nasally to me uses about the 600 to 700 area, so I’m pulling that off — pulling that out. That’s really hollow sounding, but if I boost it… It’s like this. So a little cut. Again, what I would do is if you’re not quite sure why something isn’t quite sounding right, have some fun with it. Just do this. Boost. See there how middle-y? And I’m adding some more air over the top. So all I did was pull out a little bit of that kind of nasalness. So not a huge amount of EQ going on there, it’s more a little bit of compression, and a little bit of top end boost, some low roll off, and then a little bit of correctional EQ getting rid of those lows — those low mids, kind of that mid area of nasalness. So there’s a basic overview on EQs. Now, you can get a little bit more involved. Another version of EQ would be a multi-band compressor, and I’ll show you that in a second. So next, obviously, and we can stick on the vocal, would be compression. Now, I’ve got quite a lot of levels of compression going on. I’d like to use a few rather than one, and not use it too aggressively. So here’s — my first compressor is actually on the vocal itself. The lead vocal track, and it’s the R-Comp — the R-Vox, sorry. So there’s a little bit of vocal discrepancy in volume, because, [singing], I’m exaggerating for effect, but that middle line is just a little bit lost, so we’re going to compress the top of the two lines, each side of it. So what’s happening is just bringing down the level of the first line and the third line just a little bit, and then allowing the middle one to just pop out a little bit. So that’s the subtle amount of compression. I’m using that on the vocal itself there. Here, I’ve got a little Renaissance Compressor that I like. It literally needs to be 50 above to let one dB go through. So that’s really dramatic, but at two to one, I’m using it very subtly, I’m using it just to control just a little bit. See, the thing is, all these different compressors have different sounds, and I do really like the R-Vox, but I don’t like it when it’s too aggressive, so I’m using it again after that one. I like — a lot of compressors like this — the great thing about plugins — plugin compressors, is they make all different types, some based on real compressors, like a Bomb Factory does an 1176 one, and you have a variable attack and release. We’ll do more discussion on compressors later, we’ll do a whole series just on compressors, but the reason why I like a lot of these compressors is they’re quick and easy to move. I mean, here I am, I’m mixing in a hybrid system through a console, and I’m mixing a session using plugins, so I like to be able to move quickly and get different sounds. That’s the reason why sometimes, I favor different compressors, and you know, bearing in mind, I’m also using a little bit of compression at times on the SSL. So it — it’s — for me, it’s best to use things that are easy to use, quick to use, and get results, rather than sitting there and playing with something for absolutely ever. Because some compressors, and I know, most hardware compressors, some hardware compressors literally, you have to spend an hour trying to get it to sound good. You know, they have one setting they’re great at crushing. The great thing about plugins is you’ve got a lot of variation, so you can really do some fun stuff. So that’s compressor basics on vocals, we’re going to hear it on bass as well. Let’s just take a little bit of a loop of a bass. Here, I’m just using a DI. But I duplicate the DI to do some fun stuff, I’ll show you that in a second. So as far as the compression on this is concerned, I’m using the Renaissance Bass, which is an amazing tool, which basically is like a multiband compressor, it’s bringing in some low end, but I actually use a multiband up front. This is what I’m using for compression. It’s basically — it’s an MV2, it’s basically a parallel compressor in a box. It is genius. There are different parallel compression stuff — what this does is it literally takes the lowest signal and pushes it up, and takes the highest signal and pushes it down. The way that parallel compression does is it does a very similar thing, because you compress the signal very heavily and evenly, and pull it up underneath, so it’s always there. This is a parallel compressor in a plugin. I really, really like it, there’s probably other manufacturers that make it, so look for this kind of thing, but this is very useful, especially on bass. Still good. It’s a good little tool. So that’s basically what I’m using on compression on the bass. As you can see, I recorded the DI pretty compressed going in, so it’s quite even. You know, I did this DI a long time ago, recorded this DI a long time ago, on a Precision. Okay, so we’ve done EQ and basic compression. Let’s see what other fun things there are. I think the next two that you’re probably going to use on a day-to-day is going to be reverb and delays. Quick overview on reverb. Okay, so we’ll take the vocal here. Okay, so you can hear a lot of things going on here. Now, I have a plate simulation. Again, it’s a Waves one. I don’t always use the Waves one, the Digidesign one — sorry, the AVID one is actually really good as well. But you see, I have a plate here, let’s turn everything off but that so you can hear it. Okay, so here’s just the plate. The thing about this plate that’s really good, and most of these reverbs have this kind of thing now is you can adjust the EQ of the verb, so I’m keeping it dark so it just kind of adds some presence in the real sense of the word, it makes it feel like there’s something else going on there, but without all that extra top. It’s pretty big, it’s set to 2.4. About two and a half seconds. It’s a large room, and you know, this is important to me, because I’m running it on a separate buss or auxiliary, so it has to be on 100% wet. If you put it on the vocal itself, of course you can bring it down and blend it, however, I like to do that, because then, my lead vocal remains constant, and then I can adjust, as you can see, all of these different volume rides of where the reverb is getting bigger — see, it’s less in the verses, increase in the pre-chorus, and then cranks up quite considerably in the chorus. So there’s lots of different reverbs. Another reverb I’m using here is a tiled room as I call it. It’s basically the same reverb, but it’s — it’s the same company, but it’s a lot shorter. But here, you’ll see I have a short time and a pretty long pre-delay. Okay, great. Now, delays on the vocal here, I’ve got a few delays. What I’m doing here, and I’ve explained this in another video, is I’m actually using a compressor across it and sidechaining, but I can take that off so you can see it. So I’m actually running that at the same tempo as the song, so 65 BPM, I’ve got the mix set to 100, again, so I can adjust the volume of the delays. I really like EchoBoy, I mean, you have a lot of different sounds and stuff you can do with it, but it’s a great, great plugin, and then I’m running another delay, the same thing here. This one is a quarter note delay, and then last but no means least, I’ve actually got Decapitator running here for some distortion, with a tape delay after it. So I’ve got a taste of that underneath, just a slap delay, like a really, really short delay with distorted signal going into it, just to give it some grit and grime. It’s a really, really tasty effect. Okay, so there’s a brief overview of delays and reverbs and how I used them. The only other thing I can talk about is multiband compression while we’re here. We could do a whole video on multiband compression, and we may well do that. Just, this is our brief overview of plugins, and it’s really so we can have a discussion about stuff. No matter where I’m playing, whether I’m playing a low note like I was there, or whether I play high, you still feel that 250Hz, it doesn’t disappear. And I say 250Hz, and below. So that’s what a multiband compressor is doing there. You’ll see it’s bypassed, bypassed, bypassed. It’s compressing specific frequencies. Now, you can use multiband compression in many different ways. You have to be careful. I tend to use it on very one-dimensional issues, like low end on bass guitars. If you get really carried away across the whole mix, it can make your mix louder, because it can sit there and compress all of the elements of the mix evenly so you can turn it up, but what may happen then is you end up with a mix that just sounds dreadful, because everything is evenly at the same level, and everything is super, super loud, but it doesn’t sound musical. Things aren’t designed to — or necessarily be heard at an even level at all times, so you’ve got to be careful with it. It is a useful tool for fixing things, and in this instance, I love it, because what I’m doing here is I’m just compressing the low end. The low mids and the lows. Cool. So that’s a really quick overview of plugins. If you’re watching these lessons in order from one to seven here, I’m just trying to give you a little grasp of what compressors, and delays, and reverbs, and EQs do. 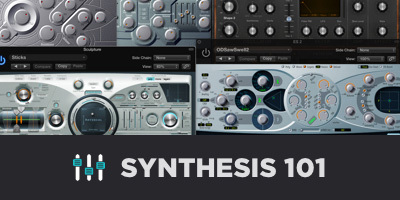 We’ll get into in a further lesson just specifically working on an EQ, or just specifically working on a compressor, or delays, effects, etcetera, but this is more of an overview for those of you that are first discovering plugins. But please, as ever, leave some questions, leave some comments, I would love to have some dialogue. I love people talking about different things. I learn so much just from doing lessons recently, I’ve learned so much from people having their opinion on what they use and how they use their plugins to create similar things that we do. So thanks very much for watching, and please as ever, subscribe, go to producelikeapro.com and sign up for the email list and get some free goodies, and thanks for watching!